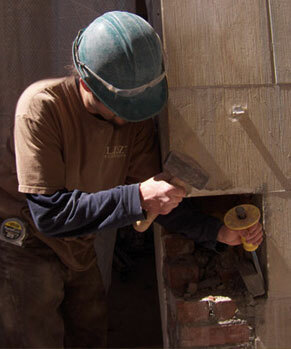 Liszt Historical Restoration, Inc. has been restoring vintage masonry buildings in the Northeast for over 20 years. Although we work in the masonry field, we do not consider ourselves a ‘masonry company’. Masons build things, and although we occasionally build things with brick and stone, and other masonry elements, we focus on repairing existing structures rather than building new ones. This focus allows us to excel in the restoration craft rather than attempting to do both. Our craftsmen are quite capable of building things, but would rather restore an older building or a newer one that has been improperly constructed or has other issues causing premature masonry failure. This focus has allowed us to become very good at what we do, without engaging in mass production masonry construction where production is the name of the game: build as much as possible as fast as possible. This mass production mindset is deadly where restoration is required. A high-quality restoration requires that the seemingly tedious details be followed through every step of the way with patience and a thorough eye for the small things. Restoration also requires the use of materials and techniques that are obsolete and forgotten in the mass production world. Liszt Historical Restoration rarely hires anyone with experience in the realm of mass production masonry for this reason alone; those trained in the modern masonry field are not easily retrained in restoration, and often don’t make good restoration craftsmen even though they are excellent ‘masons’. Rather, Liszt Historical Restoration looks for other qualities in new hires such as intellect, capacity, what other interests a person has, what other work they have done that is detail oriented and requires self-discipline, maturity, leadership even musicianship; a person infused with creativity. Hiring a person based on masonry experience often overlooks the other finer qualities and factors that determine a person’s overall ability to thrive in a trade that requires more than simply building something as fast as possible. A well-rounded person with a wide span of worthy interests and an artistic disposition and no experience is the far better restoration craftsman than the person with a strong back, fast hands and 15 or 20 years of modern masonry experience. The person whose interests include playing a musical instrument, reading historical documents, gardening and other creative/artistic interests and drive in continually learning new things, because they love to learn, makes the better restoration craftsman than the one whose interests are limited to Nascar, hunting, fishing and have no interest in learning beyond what they already know and have done for 15-20 years. Not that one is necessarily a better person than the other, but the former is much more likely to enjoy and perform well in the restoration field than the latter. Restoration requires of the craftsman a broad spectrum and a capacity to constantly expand and learn by necessity; not so with mass production construction. © 2008–2019 Liszt Historical Restoration. All rights reserved.